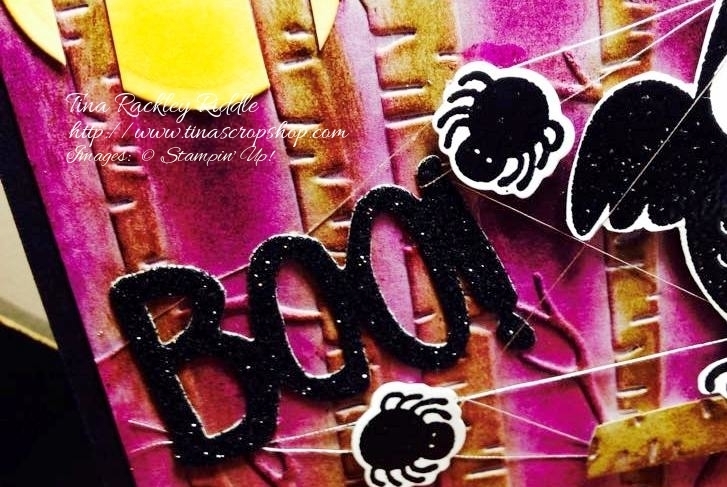 Hello and welcome to the October One Stamp At a Time Blog Hop! It is such a blast to be able to participate in this awesome Hop with this super talented bunch of crafty Friends! This month's theme is Halloween or Fall. 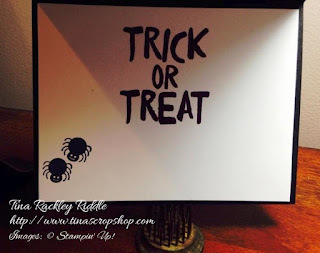 If you've been hopping already, you should have landed here from Dena Rekow's blog and by now already know the theme! Dena is awesome so I'm sure you enjoyed her blog! Since we have a Halloween or Fall theme going I thought it would be a great chance to get another Halloween card made for one of my sweet granddaughters. Now I have to admit that I'm not always into the Halloween stamp sets but when I saw this adorable owl in the "Howl-o-ween Treat" stamp set, how could I possibly resist?? Not only is it such a great stamp set but it has coordinating framelits that you can purchase in a bundle... how cool is that??? I started out wanting to just use the owl but then those spiders were so cute I had to have a little spider/spider web action going on too! Here's a closer view of the spider web. That poor owl flew right into it! I love that the coordinating "Boo To You" framelits have the word Boo in them! I used some of the awesome Black Glimmer Paper for it and it really stands out! So as you can see, for my 3-D Project I decided to make a treat holder that would coordinate with the card. Did I mention I love owls??? Here's a little closer view. I used the Scallop Stripes Thinlit Die to cut Blackberry Bliss cardstock and then layered it over the Basic Black for the body. My bone folder was used to curl the little scallops and then I reattached at just the top with Multipurpose glue. I hope you've enjoyed my projects and are ready for some more inspiration! When you click the next button you'll have quite a treat because Terri Takashige is fabulous! Enjoy! In case you lose your way, here's a list of everyone on our Hop! Make sure you stop by them all! OH my gosh are these adorable!! I just love owls (and perfect with the Curvy Keepsakes Box!! And the Woodland with the background! Just fabulous! TFS!! 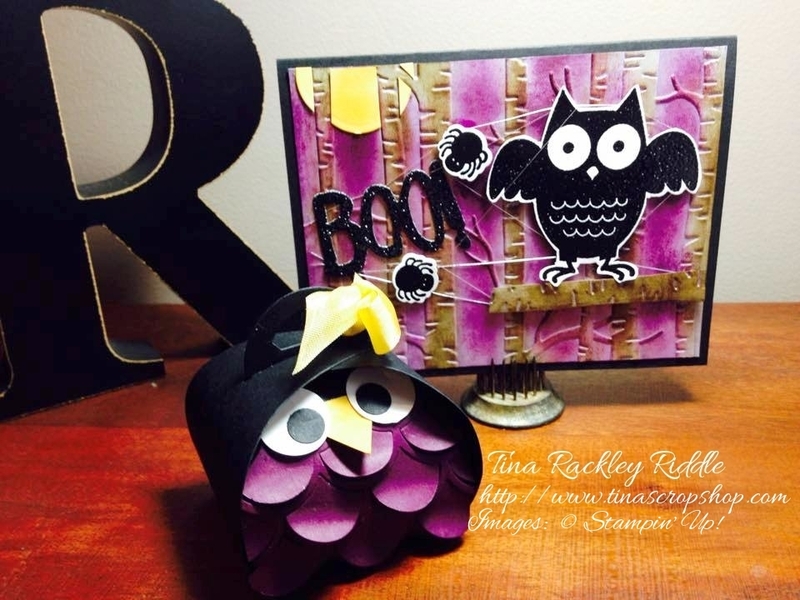 I love owls too and your projects are just adorable! I love that spider web you created that the owl flew right into. I'm not sure I totally get with how you made that owl in the treat box, but I'm terrible at following directions. This is a cute project I'd like to try though! Awww.. thanks AJ :) You could totally make that owl, he was super easy! i am not sure which i admire more....the web tangle or the yellow bow - too too cute! The card is SOOOOOO cute! The owl is super cute too! I'm reading the Harry Potter series right now and it is very fitting! One of my favorite sayings! Thanks Marisa! I just love your purple owls! you always do such incredible work! This is adorable! So clever to use the scallop thinlit! Such cute little projects. Love the use of Blackberry Bliss for the background on the card. Both of these rock! Love them! I love, love, love these! 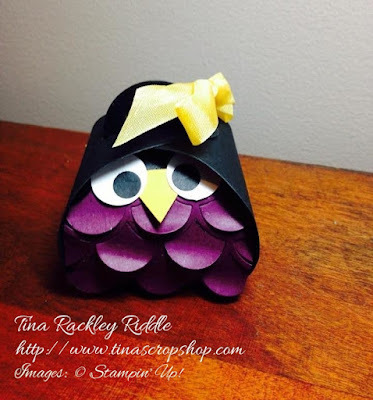 I have to make one of these owls! Stinkin' cute doesn't even describe your owl! I can't find the words to say how cute!! Owl-weeee! I love the many uses of the curvy box and you rocked it! 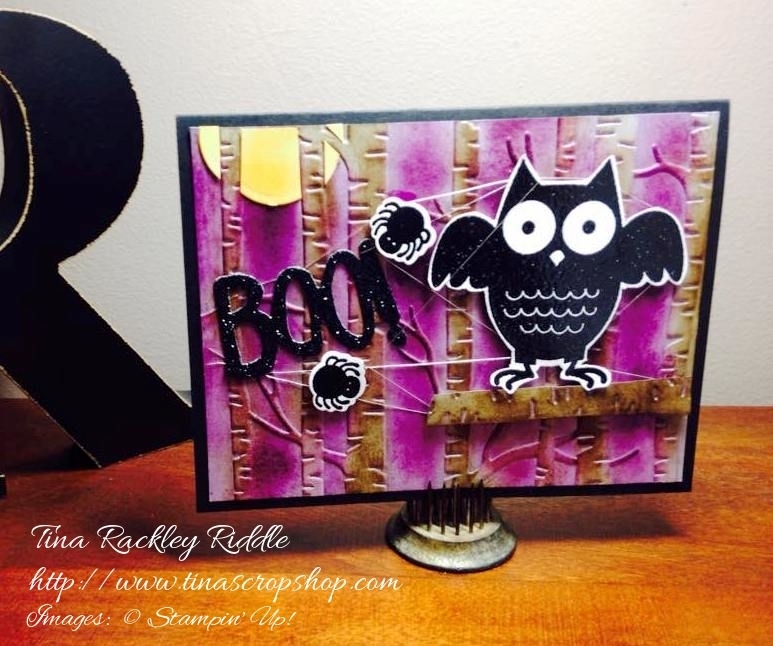 The blackberry bliss on your card is such a perfect combo with the black.